If a Pendulum Monster you control is destroyed by battle or card effect: You can Tribute 1 monster; Special Summon this card from your hand. If this card attacks, your opponent cannot activate any Spe..
Pendulum Effect:- If your "Performapal" or "Odd-Eyes" monster attacks a Defense Position monster, inflict piercing battle damage to your opponent. Monster Effect :- During damage calculation, if your ..
Pendulum Effect:- Once per turn: You can Fusion Summon 1 Dragon Fusion Monster from your Extra Deck, using monsters from your hand or field as Fusion Materials. Monster Effect:- At the start of the D..
Pendulum Effect:- Once per turn: You can target 1 "Performapal" or "Odd-Eyes" monster you control; this turn, that face-up monster is treated as a Tuner, also its Level becomes 1 (even if this card le..
Pendulum Effect:- You cannot Pendulum Summon, except from the Extra Deck. This effect cannot be negated. Each player applies 1 of these effects based on the number of Set cards in their Spell & Trap Z..
Pendulum Effect:- Once per turn: You can target 1 Fusion Monster you control; it gains 1000 ATK for each monster your opponent controls, until the end of this turn. Monster Effect:- 1 "Starving Venom..
Pendulum Effect:- Once per turn, when an opponent's monster declares an attack: You can target 1 "D/D/D" Synchro Monster you control; destroy as many monsters your opponent controls as possible with D..
Pendulum Effect:- Once per turn, if you have a "D/D" card in your other Pendulum Zone: You can Special Summon 1 "D/D/D" Xyz Monster from your Extra Deck, except "D/D/D Super Doom King Dark Armageddon"..
During damage calculation, if your Defense Position monster battles an opponent's monster while you have no Spells/Traps in your GY (Quick Effect): You can discard this card, then target 1 "Superheavy..
During your Battle Phase, if your "Superheavy Samurai" monster destroyed an opponent's monster by battle this Battle Phase, you can (Quick Effect): Immediately after this effect resolves, Synchro Summ..
1 "Superheavy Samurai" Tuner + 2+ non-Tuner "Superheavy Samurai" monsters. This card can attack while in face-up Defense Position. If it does, apply its DEF for damage calculation. Once per turn: You ..
Pendulum Effect:- If you control no monsters: You can Special Summon this card from your Pendulum Zone. You can only use this effect of "Abyss Actor - Curtain Raiser" once per Duel. Monster Effect:- G..
You can Tribute 1 "Abyss Actor" monster, then target 1 "Abyss Script" Spell in your GY; Set it to your field. You can use this effect of "Abyss Script - Abysstainment" up to twice per turn. If this Se.. If this card is Special Summoned from the hand by the effect of a "Raidraptor" card, or Normal Summoned: You can inflict 600 damage to your opponent. When an opponent's monster declares an attack that..
3 Level 12 monsters. If this card has a "Raidraptor" Xyz Monster as Xyz Material, it is unaffected by other cards' effects. Once per turn: You can detach 1 material from this card; return all your ban..
Pendulum Effect:- If your "Ninja" monster attacks a Defense Position monster, inflict piercing battle damage to your opponent. Monster Effect:- You can reveal 1 "Ninjitsu Art" card in your hand; Speci..
Pendulum Effect:- You cannot Pendulum Summon monsters, except "Ninja" monsters. This effect cannot be negated. Once per turn, when your "Ninja" monster declares an attack: You can make that monster ga..
1 Tuner + 1+ non-Tuner monsters. Once per turn: You can target 1 face-up monster your opponent controls; its ATK becomes half its original ATK until the end of this turn. If this card you control is d..
1 WATER Tuner + 1+ non-Tuner WATER monsters. 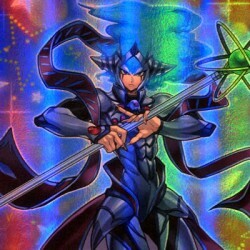 When this card is Synchro Summoned: You can destroy all your opponent's Attack Position monsters. This card can make up to 2 attacks on monsters during eac.. When an opponent's monster declares a direct attack: You can Special Summon this card from your hand, and if you do, change the attack target to this card, and proceed to damage calculation. This card..
"Gladiator Beast Augustus" + 2 "Gladiator Beast" monsters. Must first be Special Summoned (from your Extra Deck) by shuffling the above cards you control into the Deck. (You do not use "Polymerization..
2 Level 5 or higher "Gladiator Beast" monsters. Must first be Special Summoned (from your Extra Deck) by shuffling the above cards you control into the Deck. (You do not use "Polymerization".) Cannot ..
During damage calculation, if your "Destiny HERO" monster battles and this card is in your GY: You can Special Summon this card, make that monster unable to be destroyed by that battle, and if you do,..
1 "Destiny HERO" Fusion Monster + 1 "Destiny HERO" monster. If this card is Fusion Summoned: You can Fusion Summon 1 Fusion Monster from your Extra Deck, using monsters from your hand or field as Fusi..
To Tribute Summon this card face-up, you can Tribute Trap(s) you control, as well as monsters. When this card is Normal Summoned: You can destroy all Spells and Traps your opponent controls. You canno.. Cannot attack directly. If this card is banished: You can Special Summon this card, and if you do, this card gains 200 ATK for each of your banished Dinosaur monsters. You can only use this effect of ..
Banish 1 Dinosaur monster and 1 non-Dinosaur monster from your hand and/or GY; Special Summon 1 Level 7 or higher Dinosaur monster from your hand or Deck, ignoring its Summoning conditions. You can on..